About six months ago, Christian Sam Wirk of Austria turned the heads of our small group of stone slingers when he said there would be an international slinging tournament in Spain. When he told us three months later that it coincided with the launch day of Chamorro month, that sealed the deal. As people of the only flag in the world that bears a sling stone, it was only proper that Guam be visible in the world’s largest stone-slinging event. Since we felt ready enough and since slinging runs in our blood, we wanted to make a mark. We set the path. We reached out for support. Bound for Ireland and Spain, we aimed to sound the horns. Thank you very much Tony Susuico of the Grasshopper Lounge , Paddy Quinian of FunkyTown, and JP at The Oar. Our journey through Ireland was epic on all accounts. Without their help, none of this would’ve been possible. It was a privilege to watch Guelu Rosario’s presentation on the Flying Proa in Ireland with our new seafaring friends in Croshaven. It was a great time to sling with him across the Emerald Isle, and it would be an honor to compete alongside him in an event considered the slinging world championships. Still settling from an incredibly eventful 5 day adventure in Ireland on behalf of the Flying Proa — we barely made our flight through a tedious layover in London to eventually arrive Palma, Mallorca in Spain at 5:30 p.m. Feb. 25th. Upon arriving at Hotel Horizon, we received information that there would be a smaller slinging tournament on the other side of the island at 11:00 a.m. the next morning. Neither of us had ever competed in a slinging competition before so we thought we’d give it a go. After a grossly underestimated and very expensive cab ride – we arrived dazed, confused and in the land of the lost in Chamorro time, 20 minutes late, to the Monasterio de Lluc. There we found triathlon and a whole array of other activities; but our hearts dropped when we were told that there was no slinging tournament available. After deciding, instead, to find ways to make the most of our 80 euro investment, we looked about 200m away from the premises to see two guys carrying slings. Apparently we arrived at the wrong destination. After a quick conversation, they pointed us further down the road where we arrived to see several people walking around selling hand made slings, competitors with sling club T-shirts, Officials with sling league vests, and generations and full families of slingers. Happily, we were convinced that we were at the world’s true mecca of sling culture and sport. Arriving too late to compete, we stood out enough as spectators that we were invited by the event organizers to give slinging a try. They were excited when we replied by pulling our Guam-made slings out of our bags and became absolutely ecstatic when we revealed artifact sling stones that we also brought along from Guam for an around-the-world tour. After an electric and positive gathering over Guam’s artifact stones, the crowd goaded us to sling at the targets they had set for the competition. Guelu was on deck. I was right behind him. This was the time for Guam’s first slinging impression in Mallorca. Everyone was watching. They were happy to see that we knew well enough what we were doing and invited us to join them for the awards presentation at the center court of the festivities. What happened after would set the pace for the trip. Guelu and I sounded the kulu shells we brought from Guam to congratulate a brand new friend that turned out to be a winner of the event. This caught enough attention that in the process, we were introduced to Diego Camanas. The main pioneer of modern day Mallorcan slinging sport. Diego was about 70 years old, and also a former multiple-time slinging champion. He, like everyone else there, had never heard of Guam. We were happy to change that. Thereafter we were invited and driven by some locals for target practice at their sling training ground in the nearby village of Inca. From the Pacific Ocean to the Mediterranean Sea—birds of a feather had flocked together and our trip of slinging and sharing culture in Mallorca officially took flight. The people of Mallorca, Spain have been slinging stones for a very long time. As part of the chain of the the Islas de Baleares, or the Islands of the Throwers, their slinging history runs back as far as, or maybe even before, ours. Like us, Mallorcans also consider themselves islanders. As we peacefully distinguish ourselves from being labeled Americans, Mallorcans readily distinguish themselves from being called Spanish. Like us, Mallorcans are a slinging people of the world and also for the sake of cultural revival, they are also trying to expand their slinging culture. After target practice with our new hosts, Perek, Ivan and his wife Marina, we were invited to join them on a tour of their hometown of Alcudia. They brought us to sling with them at Illiot, a slinger’s fantasy pebble-stone beach with an unlimited supply of what has to be the world’s best natural slinging ammunition. The four of us spent about an hour trying to stone down a water bottle 20 yards for a ridiculously low-success rate. 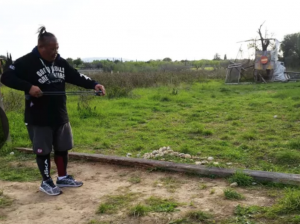 Laughingly and with relief, it was comforting to know that even seasoned Mallorcan slingers could just as often miss their target. We spent the next day visiting the Le Seu Cathedral in Palma, we were excited to bring stone offerings to the famous “Es Foner” slinger statue. It was awesome to see another culture that could wrap themselves around a sling stone as we have. After two hours of walking, taking photos and some really good coffee, we walked into an antique book and artifact shop named Nottingham Books. There we found artifacts and relics from all over the world explained to us in detail from their collector Rodney, the world’s most interesting man. We returned to Inca for another training session with even more of the locals, where we were also able to sling with world famous sling-maker Uwe Hubert, and with one of Mallorca’s most skilled competitors, Paco — known to us forever as the really good slinger dude with the long ponytails. March 1st, it was time. After a decent night’s rest, an awesome sunrise and a filling breakfast, we were corralled with slingers from the other visiting countries to jump on a bus that drove us to the competition grounds at the Fuerte de San Carlos, an ancient battleground on the perimeter of an old military fort. Everything that had happened in Mallorca up to that point had already made the trip more than worth the efforts and expenses to get there. 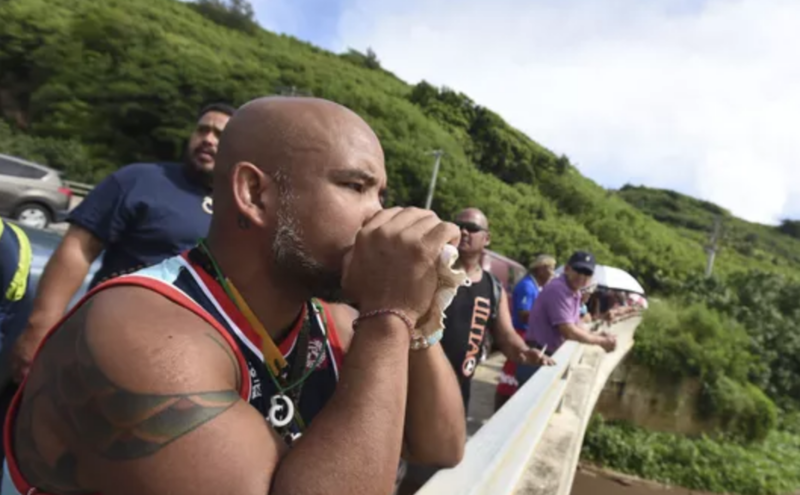 When Guelu and I were given the great honor of blowing our kulu shells to assemble the competitors and to start off the event, this completely unexpected ancestral connection was more than we could hope for. 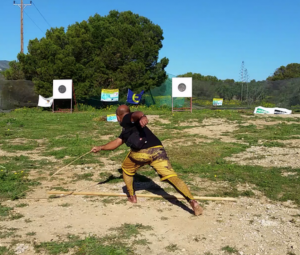 On Guam’s first step into international sling sport – using a coconut fiber sling made on Guam and with pugua in chew – Guelu Rosario hits a bullseye. An international bullseye. Fanoghe Chamorro! Legend! He would go on to hit the board another three times, but it wasn’t enough to place. After near-daily slinging the last five years, even though I never really trained for specific target practice, I felt confident enough going into the event. Unfortunately, it was confidence misplaced. From my first practice throw through the competition rounds, I never found a groove. The first shot I missed, the second shot I came close, the next I missed again. In front of about 150 competitors, spectators and officials, I repeated this round after round. After almost 30 hours in actual travel, on the day where it seemed to matter most, I arrived at the other side of the world to shoot 0 for 30 in front of the performers of the world slinging community. Stone cold rock bottom… I slung a perfect game. Perfectly wrong. Perfectly embarrassing, and humbling for sure. But it was also oddly motivating. Culturally driven but competitively severely inadequate, I could have and should have done things differently. But, it is what it is. Forward I go. Today, 15 slinging countries know our name. Guam has made its slingling mark, and the first in Mallorca is a Guelu bullseye. We have faith that Guam and the Mariana Islands will become a great asset to world slinging sport. The wheels are in motion. Our success is literally just a stone’s throw away. Guelu will be back and so will I, and hopefully with others in tow. Again and again. For Guam’s honor.